Vacation is finally over and I am a little sad to see it go. Josh and I had an entire week off and we did absolutely nothing. Well, we watched an obscene amount of movies and did our fair share of cooking, baking, and eating, but nothing too strenuous. It was nice to relax and spend time together. One of the highlights of our week was breakfast time. Every morning we made a special breakfast to enjoy together. One of my favorite recipes from the week was apple cinnamon baked oatmeal. I usually wake up every morning at 5:00 so I can go to the gym and get my day going. I also like to go to bed early, but things changed while we were on vacation. We stayed up late every night and slept in almost every morning (Josh says 7:00 doesn’t count as sleeping in, but for me it is sleeping in). It was nice to slowly wake up and stay in our pj’s while we cooked breakfast. On a cold, snowy morning we made apple cinnamon baked oatmeal and it hit the spot. Baked oatmeal is comforting, satisfying, and delicious. 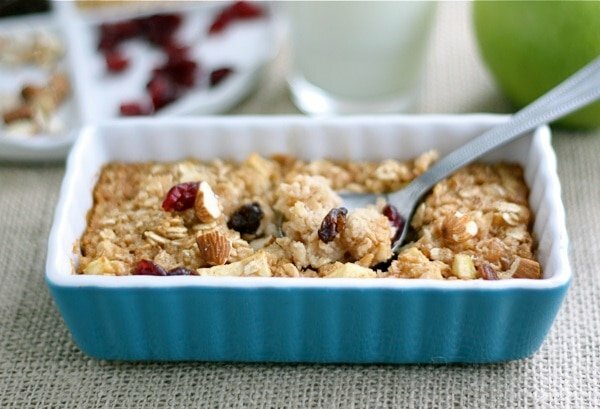 This baked oatmeal recipe is seasoned with cinnamon and diced apple chunks. It is easy to put together and only takes 20 minutes to bake. I like to serve a buffet of toppings on the side. 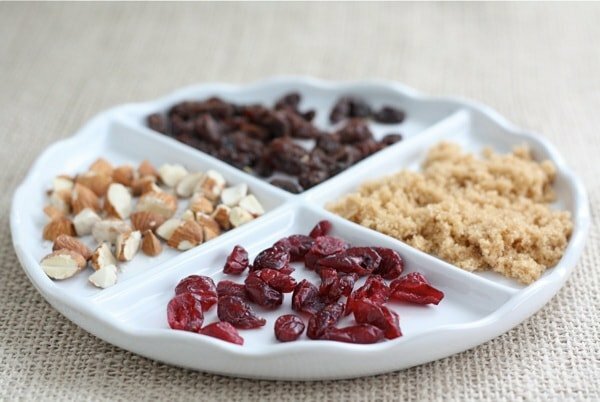 A few of our favorites include: raisins, dried cranberries, chopped almonds, and brown sugar. I also like to pour warm milk over the top of my portion. So good! If you have leftovers, don’t throw them out, baked oatmeal is great reheated. It will keep in the refrigerator for about a week. Make a big batch on Sunday so you can enjoy a healthy and delicious breakfast all week long. 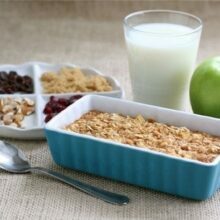 If one of your New Year’s resolutions is to eat healthy, add apple cinnamon baked oatmeal to your breakfast menu. This oatmeal is a good source of fiber, fruit, calcium, and will keep you full for hours. 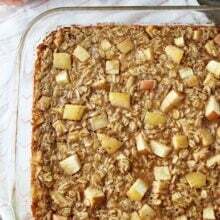 Start your day off right with apple cinnamon baked oatmeal. It is warming, wholesome, and good for the soul. This easy baked oatmeal is a fall breakfast favorite! In a large bowl, combine oats, brown sugar, cinnamon, baking powder, and salt. In a medium bowl, whisk together milk, applesauce, butter, egg whites, and vanilla. Pour wet ingredients over dry ingredients and stir until combined. Gently stir in diced apples. Pour oatmeal mixture into prepared pan. 7am is sleeping in for me too… hehehe. Glad you guys had a nice, relaxing break! This oatmeal looks delicious. I thought my getting up at 5:45am was early. 5am really is early. The kids slept in until 8am today – the lie-in was fantastic but back to normal tomorrow. Oatmeal looks wholesome and delicious – my favourite breakfast! The oatmeal looks delicious. Will try this at the weekend – already looking forward to it! Maria, your blog is lovely! Thanks for your visit…my son loves apples an he will adore these cookies thanks for the recipe! Baked oatmeal is about my favorite breakfast meal. So good & filling. Your recipe looks wonderful! I really like the idea of the toppings. Sounds absolutely delicious… and I love that it is good for you!! Great job! 5 AM is my wak-eup call too. I love getting my workout in and having a few moments of peacefullness before house gets up! Do you think I could cut the recipe in half for our weekday morning breakfast routine – 20 min is just enough time for me to gets kids dressed, coffee made and backpacks packed! If you put the oatmeal into individual serving dishes it would cook faster. You can also make it the night before and just reheat in the morning. It reheats really well. I sometimes make a big batch on Sunday so I have it to eat during the week. baked oatmeal..i kind of like the sound of that. happy new year, maria! looking forward to sharing more memories with you in 2011! Oatmeal is a breakfast staple during the work week. I have never thought of baking it, but I can imagine it tastes amazing. I’ll give it a try. Yum! Just made some homemade oatmeal yesterday – this looks tasty! This looks like the perfect breakfast!! Mmmm! I love baked oatmeal! This recipe looks fabulous! Baked oatmeal is one of my favorite breakfasts. Looks fantastic! I’ve never baked oatmeal, but will be giving this a try. Looks so soothing on a cold morning!! We make a berry baked oatmeal that is our favorite breakfast!! This looks fantastic and your break sounded wonderful! Love oatmeal for breakfast. I’ve never baked it before. Is the texture chewier? It is maybe a little chewier, but I usually add a splash of milk to my bowl. I am super upset that vacation is over as well! I love making fun breakfasts after I sleep in a bit, but this is one that can certainly be enjoyed during the work week as well! Delicious. so wonderful, it looks so hearty and wonderfully flavorful. with a breakfast like this, how could you have a bad day! It sounds as though you and Josh had a very relaxing holiday. We slept in each day too – even made it to 8am one day, which is unheard of for us! This baked oatmeal sounds like just the thing to warm me up on a cold morning. We have been enjoying steel cut oats almost every morning with raisins, chopped apple and brown sugar. It is a great way to start the morning and it stays with you, too. Glad you had a nice vacation. Doing nothing can be the best fun. We love steel cut oats as well. I love this wholesome and warm breakfast idea. Can’t wait to try it! Your baked oatmeal looks super yummy! I agree, great for a winter morning! Happy New Year to you both! Does this reheat well? I’d love to make the night before and pop in microwave to reheat! Yes, it reheats well. I like to make a big batch so I can eat it all week. Just reheat in the microwave, you might need to add a splash of milk, but that is it! Great thanks! can’t wait to make it this weekend!!! Sounds like a wonderful week Maria! My husband was off for a week too, and it was so nice to have the time together. 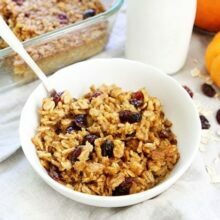 I have never baked oatmeal, and it’s really hard to get my kids to eat breakfast, so I am going to try this, I think they will like it and I know I will! Yum! I eat oatmeal daily, and this seems like a major step up in my normal combo of peanut butter and oats. Can’t wait to try! We are big oatmeal eaters here, so I will definitively try this. I’ve never had baked oatmeal! And a vacation where you do nothing but relax in your own space and watch movies w/ the hubby sounds like a perfect vaca to me! I’ve been craving oats lately – love the idea of pouring warm milk over them! We love the idea of baking oatmeal! Don’t see too many of these kinds of recipes around. Great work! Thanks. Baked oatmeal is a great way to start the day. Looks yummy & I think I have all the ingredients. Think I’ll try this soon! This looks so yummy and I don’t even eat oatmeal! I’ll have to give this a shot, for sure! I think I may be the only one who has never heard of baking oatmeal before now! It looks good, but maybe for a weekend brunch. I enjoy sleeping in and breakfast during the week is usually a mad dash for something that can be eaten out of hand. delicious way to kick off the new year! Love this easy and healthy recipe, anytime fave. for my breakfast. Happy 2011 to you! Maria, this looks scrumptious! I love that it is baked and can be reheated for the next day. I wonder if it would work omitting the eggwhites? I imagine they firm it up a bit, which isn’t the texture my Littles are used to. Thanks for sharing. I have made it with one large egg instead of egg whites and it works well. The egg whites maybe firmed it up a bit, but not much. I didn’t mind the texture:) If you try omitting them, let me know how it works! Enjoy! I have never baked oatmeal. Looks delicious! Love oatmeal and apples. This is a great weekend breakfast. Thanks for sharing! Isn’t it so sad when vacation ends? Our ended too and I was so sad to head back to work. I love baked oatmeal. It’s always a nice change from the regular oatmeal. 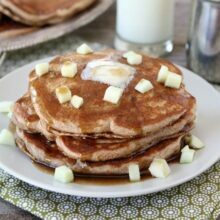 Yours looks amazing and I love the addition of apples and cinnamon. Delicious! A great treat to start the day off with. What a delicious breakfast treat. This looks so warm and wonderful, Maria. Thanks for sharing! I hope you had a very merry Christmas and a happy new year with your family. I can’t wait to see what’s next from you in the year ahead! I’m so drawn to this recipe and the picture. I think I could use a bowlful right now! Thanks so much for sharing! Mmmm. It looks so delicious – perfect for a cold winter morning. Yummy! I have all of these ingredients, I am so making this tomorrow morning!!!! Adam and I are so excited to try this. I’m making homemade applesauce tonight just so I can make it tomorrow morning. Yay. I love your recipes. your break sounds exactly like mine. It was fabulous and so hard to return to the real world!! I love baked oatmeal–one of my very favorite breakfasts. Yours looks delicious! I reheated some this morning and served it with fresh blueberries… so, so good. Thanks for sharing! Love the blueberry idea! Glad you liked the oatmeal! Those photos are lovely! I’m going to have to make a batch of oatmeal for breakfast very soon, too. I eat oatmeal almost every morning for breakfast, so I was excited to try this baked version. It is absolutely delicious! I love the texture, the cinnamon flavor and the baked apple chunks. Thanks for the wonderful recipe! So glad to have this recipe. I’ve seen a lot about baked oatmeal, but I haven’t been quite sure how to make it. It looks delicious! I made this recipe this morning and it was fabulous! I can’t wait to have leftovers tomorrow! It will definitely become a regular at my house. I don’t like the texture of normal oatmeal but the flavor and texture for this was sooo yummy! It tastes like “guilt free” apple crisp. Yum! Thanks. Yay! I am glad you liked the oatmeal! Looks yummy.. Im going to try it…. fantastic! Oooh, I *LOVE* this! I made a baked oatmeal last year, but this looks so much better! I can’t wait to try it! I love that I could make this on a Monday and have leftovers for breakfast all week! perfect! i love that this oatmeal is baked and looks packed full of flavor! i can here looking for the perfect healthy bfast recipe for me and my bf and here it is! i know i can always count on you for awesome recipes 🙂 happy new year! This was absolutely delicious. I could eat it cold as a dessert, even. Definitely a winner! It is great anytime of the day! Glad you enjoyed it! This is so great! It was really easy to make. It actually reminded me of the apple cinnamon oatmeal from the packets but WAY better! 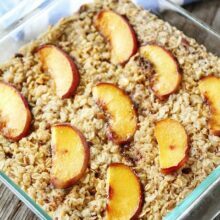 Pingback: Katie Rose Fitness» Blog Archive » Apple Cinnamon Baked Oatmeal! This was the first oatmeal recipe that I found and actually liked. The consistency was perfect. Thanks for a great weekday breakfast! Wish I had a bowl right now! Hi! I love getting your recipes & updates! This one looks awesome, but my mornings w/ three kids getting off to school are CRAZY! Do you think I could put this together in the evening, refrigerate overnight and then bake it in the morning? I’m just afraid it’ll be all solidified (is that a word?) in the morning and then won’t bake well?!?! Let me know what you think!! Thanks!! I haven’t tried making it the night before, but I am sure it would work. I have reheated it the next day and it is great. I just add a little milk before reheating it to “freshen” it up. Enjoy! I’m really confused, it says an 8×8 cooking dish, so would this be halved for the amount that would fit the dish in the picture? I usually make it in an 8×8 dish, but I made it in a smaller dish for the photos:) It is more pretty in that dish..ha! Oh my this looks absolutely too good to be true! I’m definitely going to try this recipe tomorrow night so I can have it ready to go all week long. So delicious! Not at all gummy like oatmeal cooked in the microwave or on the stove. This is my third recipe from you guys and they always turn out so well. This looks delish! We have a son with egg allergies, so might you have any ideas about a substitution for the 2 egg whites? I’m not sure what the egg whites do in this recipe—add lightness, or serve as a binder? Thanks. I’d love to add this to our breakfast rotation to give them a filling and healthy start to their day! I’m trying to convince my friends here at the students’ residence to eat a little more healthy so I made this for our big breakfast last Sunday and they were all thrilled. Delicious! I made this this morning and loved it! Will definitely use this recipe again in the near future! I have made this so many times and it always disappears so fast. Sometimes I even munch on it as a dessert. I usually throw in some raisins and crushed up sliced almonds as everyone in my house likes them. And I usually just use 2 whole eggs because I’m lazy and it seems to come out fine. It’s great hot or cold and it does keep well for several days (if it lasts that long). I love having a quick and filling breakfast on hand and I love that we are eating more oats. Thank you so much for this recipe. Glad you enjoy the baked oatmeal! Would this recipe work with Gluten Free oats? Also, I need to make this recipe for a crowd. if I double or even triple it and put it in a 13 x 9 pan, how long should I bake it? Would I double the time? I am sure GF oats would work. Yes, you can make a large batch. I would set the timer for the original time and then check it. If it is not close to being done, bake for longer. Enjoy! This has become a staple in our house. Today I didn’t have some of the ingredients, so I swapped. It was so good! Almond milk for the milk, and 1/2 cup canned pumpkin because I only had 1/2 cup applesauce. Love it! I usually make it on the weekends, then warm it up during the week. Thanks so much for this deliciousness. You are welcome! Glad the oatmeal is a staple at your house! Oh my goodness… I just made this for breakfast. Absolutely delicious! I didn’t have granny smiths, so I used pears instead. I’ve never had better oatmeal. SO GOOD. I can’t wait to try more of your recipes. Specifically, the zucchini chocolate chip cookies! I love my oatmeal and this is truly one for my next breakfast. Great site by the way. Yum! I had this for breakfast this morning and it was awesome! Perfect texture and great balance of flavors. I topped mine with some chopped walnuts, raisins, and a splash of milk. I actually mixed this up and baked it last night, so I just reheated a small portion for breakfast this morning and added my toppings. So easy and tasty AND I’ll be able to eat it for breakfast all week. Thanks for sharing a great recipe! Had never made a baked oatmeal before. this had really good flavor, but was a bit dry for my tastes. Try serving with yogurt drizzled over the top for a bit more moisture. Hello! I am from Costa Rica and I would like to know if I can change the apple sauce in the recipe since not always we can have apple sauce in our super markets. You can try oil or butter? Is it possible to make this with cooked steel cut oats? How would this recipe be adjusted? This is delicious! Today is the 3rd Sunday in a row I’m making it for grab-and-go breakfasts for the week. But I do have to say it takes more like 30 minutes to set the oatmeal- it could just be my oven (but this is the only recipe where I have to cook it for significantly longer than the recipe suggests). Hello! I just made this baked oatmeal for breakfast, and it was delicious! I added a cup of raisins. Just wondering— would this be okay to put in the freezer and reheat later in the month? Sometimes my morning routine gets the best of me and I forget to eat breakfast! I was thinking this could be a good thing to have on hand for those mornings. Made this last week. Was delish!!!. I am all out of applesauce though, what can I substitute? Hello! I was wondering if you’ve ever used almond milk instead of skim? Thanks so much for the great recipes and congratulations on your pregnancy! How many calories per serving? I am really enjoying oatmeal for the first time! I love love this recipe! I have made the recipe twice and it so easy. Perfect for “leftover” breakfast throughout the week. Now I’m going to experiment a little with adding other fruits and spices. Can’t wait! This is delicious! I made it so I could portion it out for the week but couldn’t help and eat some right away! Great texture and perfect flavor. Thank you! Just made this. Absolutely delicious!!! I did use Almond Milk instead of the Skim. I am overwhelmed by all these delicious recipes. I could just park myself here, learn these recipes and be a cooking expert because of all of these great ideas/ resources. You MUST get a regular cookbook out there, for times when I run out of ink or technology isn’t my friend!! Haha! Thank you so much for sharing. Love this delicious recipe. I make it often. I cook it early in the week, cut into large slices and store in fridge. Family grabs a slice, tops with a little milk & favorite toppings. Quick healthy breakfast all week long! Thank you! Can I use something other than brown sugar to sweeten this? Like maple syrup? I make this in muffin cups as well! Great recipe…thanks for sharing. It was delicious, but do u have nutrition info, calorie count?